The Middle Atlantic MRK Cage-Nut Style Rackrail Kit PROMRK-RR44 is designed as an alternative to the standard 11 gauge, 10-32 threaded rackrails included in the MRK Series of racks. Simply remove the standard rackrails and replace them with this kit to fit your needs. Cage nuts and rack screws must be purchased separately. This model is made specifically for MRK 44U racks. All-steel construction guarantees years of use. Box Dimensions (LxWxH) 79.0 x 3.5 x 1.8"
Why nowhere in the spec it's mentioned that it's only two rails? 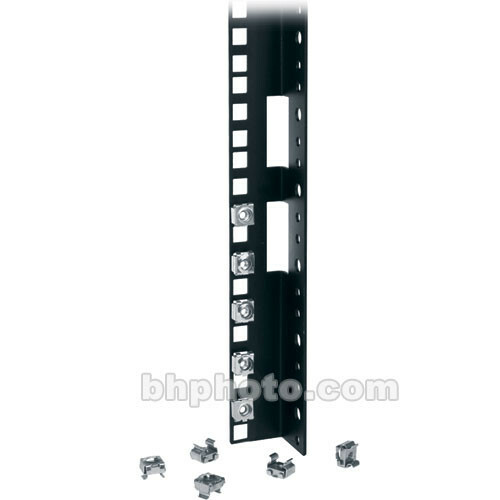 This product is a Rackrail Kit offered as a heavy duty replacement for the rails in the MRK/VRK Series racks. Sold in pairs. If you check the tab onthe product page labeled In the Box you will see that it states 2x rack rails ( 1 pair ). We also have Representatives available by Phone or Live Chat who are able to assist or answer any questions you may have regarding available products.